Is it Saturday again already? I'm not even sure how that happened. The week flew by and I think the only thing that gathered in my sewing space was dust. As much as I love warm sunny days, I do not love the responsibilities that come with it. I could possibly be happy living in the land of snow 365 days a year...no mowing, weeding, or running everywhere...just home and my sewing machine. So today I celebrate the smallest of sewing victories. All of the blocks for the third section in Pat Sloan's A Flower Bouquet have been released and I haven't even touched them. One evening I found a few minutes to sort through the fabrics I'm using to plan out the next four blocks. It's been a week of slow going when it comes to working on my list for the month. I was able to cross one and a half things off. 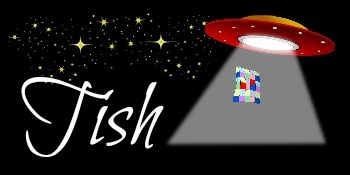 I'm officially all caught up on the Pat Sloan Out of this world quilt along. This is me sharing the top row all pieced together at the guild meeting. I didn't get a picture of this month's block, but it is finished as well. I have a UFO finish, y'all! 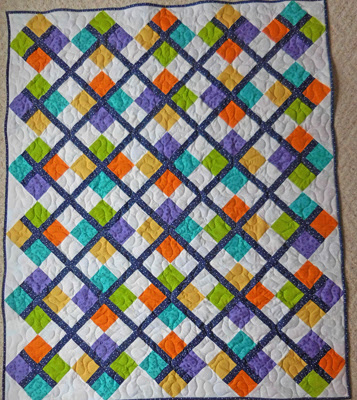 This baby quilt has actually been finished since February, I just had not gotten around to writing about it yet. You can read more about Bundle Buster Baby Quilt here. This is a quilt that color wise made me step outside my color comfort zone and I'm so glad it did. I love it. Other than that it is nose to the stone, working on the Ready. Set. Go! 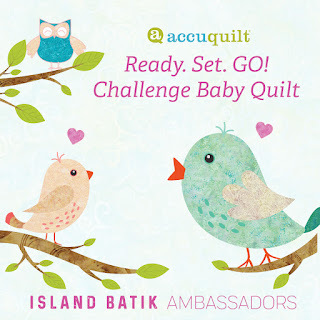 Baby Quilt Challenge for Island Batik. Thanks to the good people at Accuquilt and the Go! cutter and dyes they sent, the cutting of fabrics for this challenge was a breeze! Blocks are already forming and I hope to have a finish with in the next week to share with you. I realize I'm committing a cardinal sewing sin in this picture...piecing with white thread on black fabric...as my daughter says...it will buff. Anything else that I may start or finish this month will just be an extra. As much as I love squirrels, I really need to stay focused and get some things finished up. Speaking of squirrels and wild goose chases, Miss Vicki from Vicki's Crafts and Quilting definitely embarked on a quilty adventure when she innocently went looking through her quilting room for some paper pieced flowers. 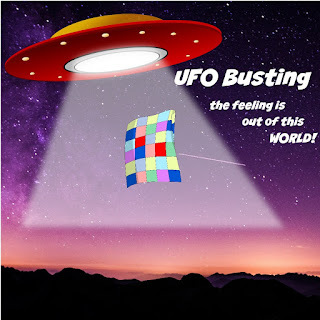 She found all kinds of things she forgot about, including what would become a UFO finish. 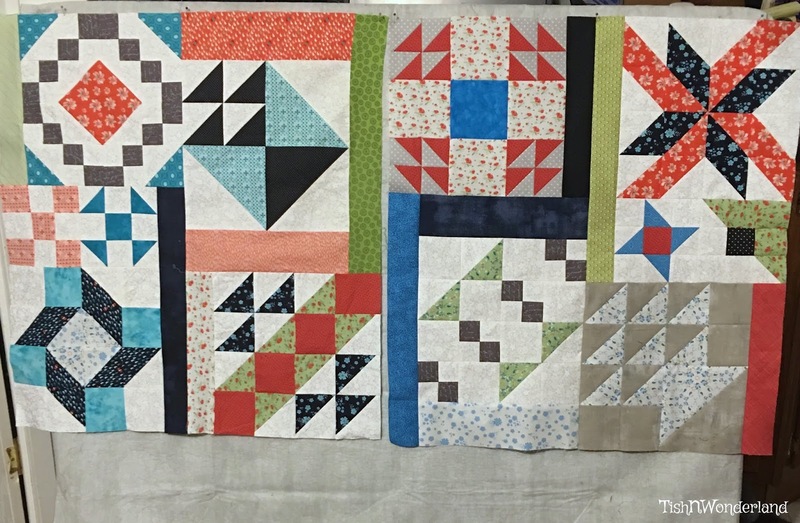 She managed to unearth this not quite complete beauty and decided it was time for it to see a finish and become a H2H donation quilt. Make sure you hop over to congratulate Vicki on this UFO finish. It's a great reminder that sometimes the trip you think you are taking may lead to somewhere else, but that's okay. Did she find her flowers? Go read and find out! Now it's your turn. 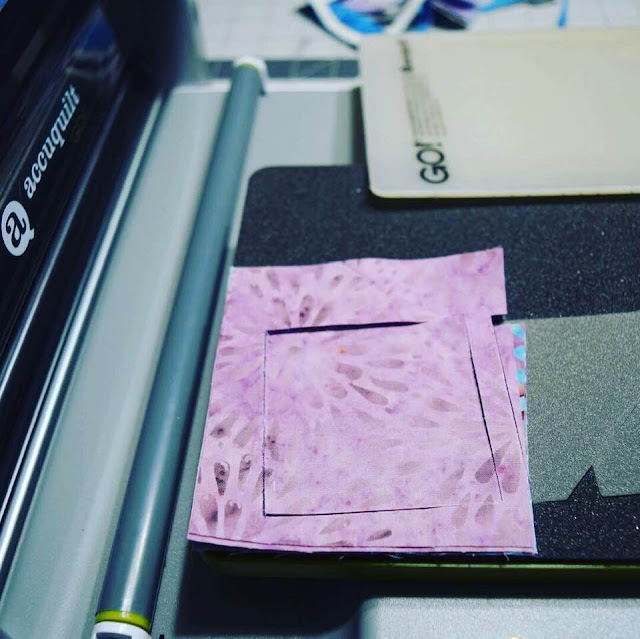 Let's see what your quilting journey has lead to this week. Link up and tell us about it below. I will be keeping things short and simple this week. Yesterday I got to celebrate my Island Batik finish for the Vintage Reimagined Challenge. 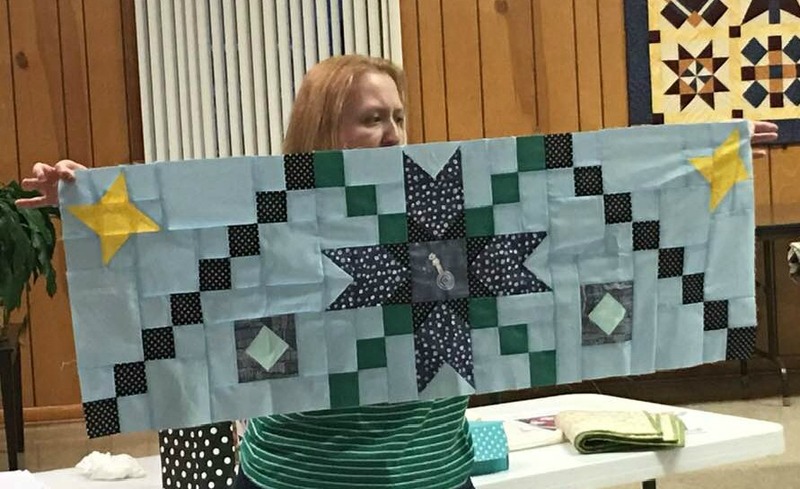 For the challenge I decided to transform the sawtooth quilt block into something fun and meaningful to me. I was beginning to get a little worried my challenge project was not going to see a finish before the end of March. But in the 11th hour I was able to regroup and pull it off. 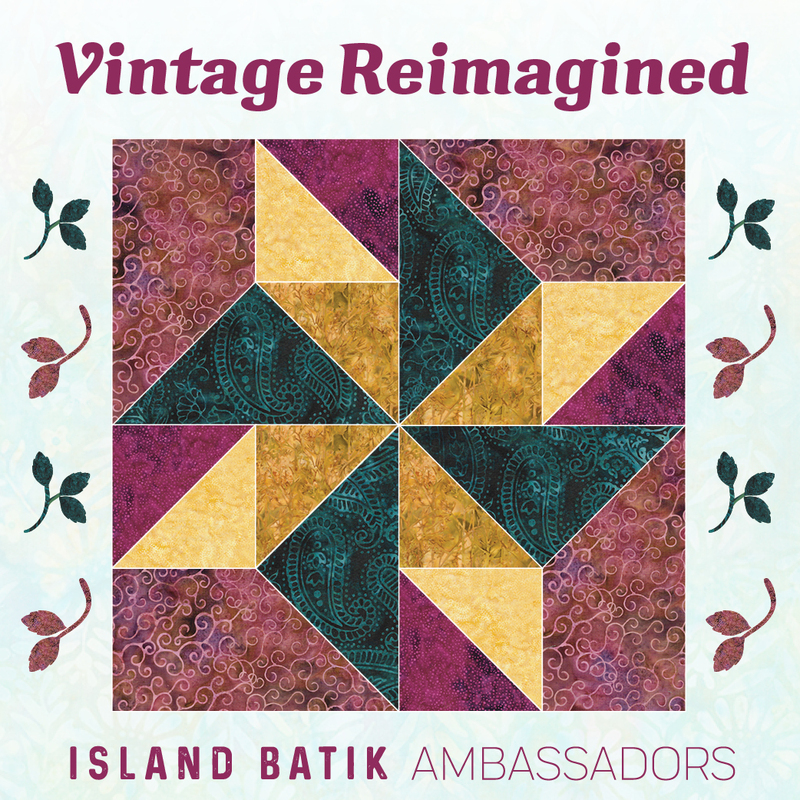 This month the good folks at Island Batik challenged us to take a vintage quilt bock and reimagine it in some way. I'm seriously thinking a March redo is in order. I cannot believe we are already approaching the last week and there is still so much left to do. 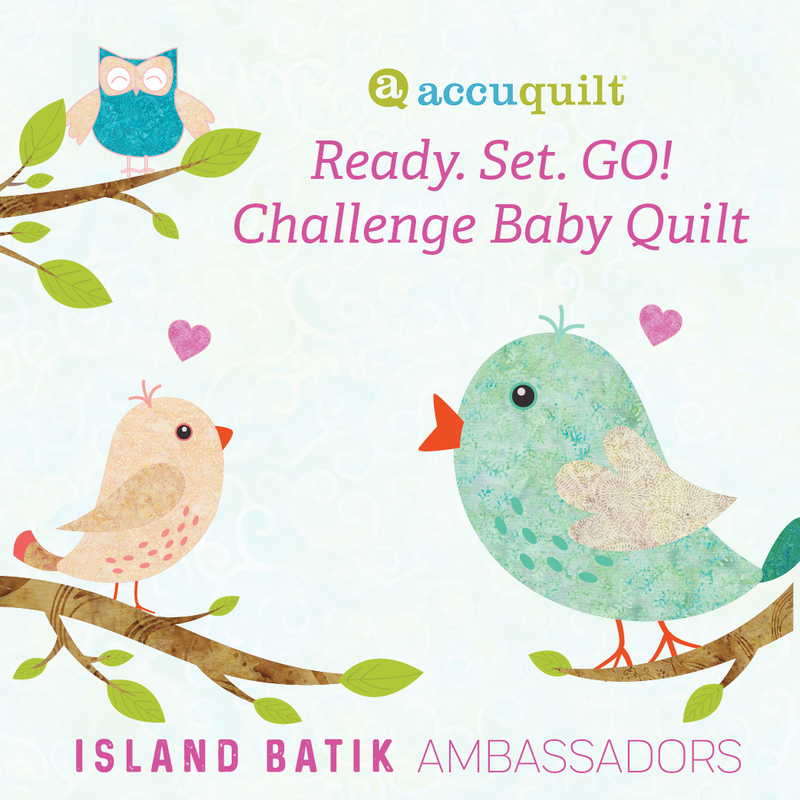 As you read this, I am locked in the back room not aloud to come out until my March Island Batik project is quilted, or possibly I'm dealing with some last minute life/adult-ing business that must be handled before the end of the month. I'm actually hoping it's the first scenario. What ever the case, I did manage to be slightly productive this week. I went two sections forward, two blocks back. Sections 1 and 2 of A Flower Bouquet are complete and the black and white polka dot sashing has been cut. However, I have fell behind on the next two blocks. I have to remind myself to stop stressing about it. There really is no dead line. So I will be putting this on hold until I catch up on a few other projects.